Formed around a core nucleus of graduates of the National Centre for Circus Arts, Silver Lining supported their debut eponymous production which we took to the The Roundhouse for Circusfest 2014. Since then we have commissioned their second production Throwback which performed at Jacksons Lane, before being remounted with acclaimed director Paulette Randall and touring a 600-seat spiegeltent at The Underbelly Circus Hub at The Edinburgh Fringe Festival 2016, before going on to tour to major UK festivals throughout the year. Throwback returned to Jacksons Lane as part of the London International Mime Festival in February 2017. This exciting young ensemble are the future of British Circus, with a skilled and invigorating blend of aerial, acrobatics and ensemble work. 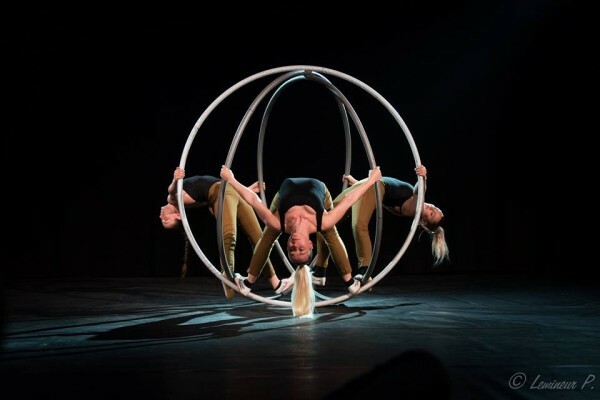 Alula Cyr are an all-female circus trio from London founded by Jessica Ladley, Lil Rice and Fiona Thornhill in 2014 while studying at the National Centre for Circus Arts. We supported the creation of their debut show Hyena and the work-in-progress has been performed in Hangwire at Jacksons Lane, at the Black-E in Liverpool and as a part of Resolution 2016 at The Place. We have also commissioned a one-off cabaret night titled A Night with Alula for Postcards Festival 2016. The show was an instant sell out and received rave audience feedback. In 2017 we produced and presented Alula's HYENA at the Underbelly Festival at the Southbank in London. With strength, skills and a rapport like no other, Alula are a phenomenon. They are currently working across the UK and internationally as the world’s first and only female Cyr wheel trio.